Elliotts's Inventory Management package allows you to keep track of inventory, which is stocked at more than one location, including the quantity of the item on‑hand, allocated and on‑order at each location. 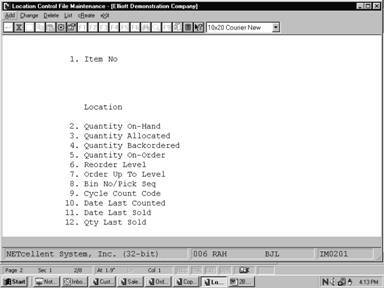 When you first enter a new inventory item, part of the data entered is the quantity on‑hand, quantity allocated, quantity on‑order and other such data for the item's main stocking location. The Location Control File allows you to define additional stocking locations for the inventory item. There are two ways to enter this information. The first is via the add mode and the second is to create a range of inventory items at a location via the create mode. Please note that the locations must be entered in the Location File Maintenance application on the I/M Maintenance window. The create mode will take the beginning and ending items specified and create records at the new location. The new location's items will have quantities of zero and blank picking sequence and cycle count code fields. You will need to access them via change mode and edit these fields to match the availability at that location. Enter the number you want to have represent the item. This number can contain alphanumeric characters as well as purely numeric digits. You may also press F7 or F8 to use the Search option. Enter the Location code for the item entered. Press the F7 key to search for location. A standard quantity format with optional minus sign. Enter the current quantity on‑hand of the item at the above location. Enter the quantity of the item, which has been allocated. Enter the quantity of the item, which has been backordered. Enter the quantity of the item that is on order. Enter the quantity on‑hand of this item, which will determine when to order more of it. Enter the amount of this item (the level) up to which your order amount should take you when added to the quantity on‑hand. For instance, if your order‑up‑to‑level is 100 and you have 20 on hand, you would need to order 80 to meet this order‑up‑to level. Enter the bin number where this item can be found. Enter the Cycle Count code for the item. For a full explanation of this entry, refer to the for Item File Maintenance. Enter the date when the item was last counted. Enter the date when the item was last sold. Defaults to system date. A standard quantity accumulator format with an optional minus sign. Enter the quantity of the item sold in last sale. Enter the starting item number for the range of items to be printed. Press the F7 key for item search by number or the F8 key for item search by description. Defaults to All. Enter the ending item number for the above range. Press the F7 key for item search by number or the F8 key for item search by description. Defaults to the starting number. Enter the starting location for the range of locations within the above item range to be printed. Press the F7 key to search for location codes. Defaults to All. Enter the ending location for the above range. Press the F7 key to search for location codes. Defaults to the starting location. 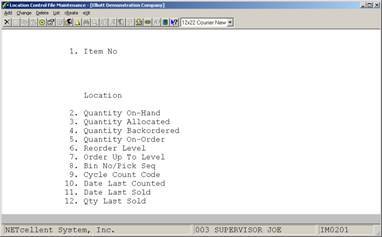 Enter C for Create new items at a location or D for deleting these items at a location. Enter the starting item number for the range of items to have locations created or deleted. Press the F7 key to search by item number. Press the F8 key to search by item description. Enter the location for the above item range. Press the F7 key to search for location codes.